Jack, a young boy whose parents have died, lives in Boston with his Aunt Arabella. When Aunt Arabella loses all her money, Jack and the family butler, Praiseworthy, sail off to California to seek their fortunes in the Gold Rush. Though Praiseworthy is a bit out of place amongst the other miners, his cleverness and ingenuity at every turn ensure that both he and Jack survive their adventure and have a great time in the process. This book got off to a slow start for me, and at first, I wasn't sure where things were headed. Once I got past the early scenes of the book when the main characters are stowed away on a ship, however, things really picked up. Praiseworthy is a wonderful character and the plots he hatches in order to escape from trouble, raise money, and care for Jack are so clever and fun to read about. His devotion to Arabella - and the reasons behind it - also give the entire story an unexpected emotional impact that I found very satisfying. For some strange reason, back in 2015 when I was reading 52 historical fiction novels in chronological order by setting, I chose Fleischman's Bandit's Moon instead of this book as my Gold Rush read. While Bandit's Moon was okay, it was nowhere near as funny or as memorable as this excellent novel, which is more on par with Fleischman's Newbery medal book, The Whipping Boy. In both of these books, Fleischman creates a really strong central relationship that drives the plot and encourages the reader to look at human nature in a different way. 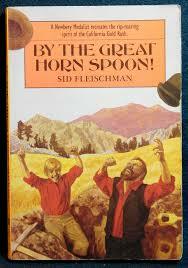 There is a film adaptation of this book: Disney's The Adventures of Bullwhip Griffin, released in 1967. It's an enjoyable film in its own right, but it deviates quite a bit from the book, changing Praiseworthy's name, making Arabella Jack's sister instead of his aunt, and adding more complicated plot points that increase the number of action scenes and change the entire ending of the book. The book is more subtle, and more clever, and I think it's important to read it all the way through and enjoy its nuances before bothering with the movie. All in all, I am really surprised by the number of Goodreads reviews that call this book dull. It was far from boring, and I think kids who are fascinated by the Gold Rush and the Wild West will love it even more than I did.